In this set of exercises the student builds a computational model of a hanging mass-spring system that is constrained to move in 1D, using the simple Euler and the Euler-Cromer numerical schemes. The student is guided to discover, by using the model to produce graphs of the position, velocity, and energy of the mass as a function of time, that the Euler algorithm does not conserve energy, and that for this simple oscillatory system, a modified algorithm (Euler-Cromer) is necessary to avoid artificial behavior in the model. discover that they bloody well can’t use the simple Euler method when modeling an oscillatory system (Exercises 1-3). that result from solving Newton’s 2nd Law analytically. Does the angular frequency match that expected for a simple harmonic oscillator of mass m an spring constant k? You may (should!) have noticed that something is not right with the Euler model of your hanging oscillator. Describe in detail the artificial behavior you observe in your model, and explain why it doesn’t represent a realistic oscillating mass. Recall that in the Euler method, the accuracy of the solution can be increased by using a smaller value of Δt. Can you get rid of the artificial behavior by making Δt smaller? 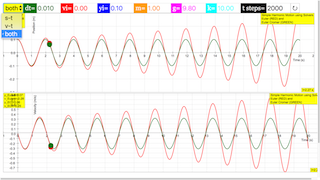 Modify your model to produce a graph of the total energy of the oscillator as a function of time. Describe in detail what happens to the energy, and the artificial behavior observed. Can this artificial behavior in the energy be corrected by making Δt smaller? What can you conclude about using the Euler method to model a simple harmonic oscillator? Build a model of the hanging oscillator using the modified Euler, or Euler-Cromer, numerical method. Compare the results you obtain (i.e. position and velocity vs. time) with those obtained from the simple Euler method, and with the exact solution. Comment in detail on your results. Modify your model to produce a graph of the total energy as a function of time. Is energy conserved for the Euler-Cromer algorithm? Toggling between the combo box will give you the respective views. Setting the variables in the control panel will adjust the graphs accordingly.